Go Green Kids! 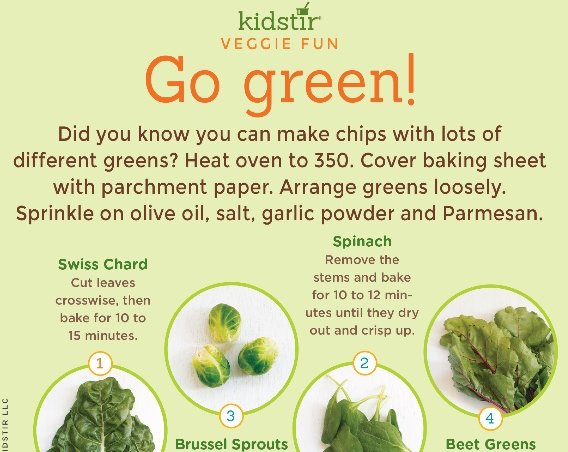 Did you know you can make baked veggie chips with lots of different salad greens? Cover baking sheet with parchment paper. Sprinkle on olive oil, salt, garlic powder and parmesan. It’s easy to make healthy chips for a great snack any time. Brussel Sprouts – Trim off the stalk and peel off all the leaves. Bake for 10 to 15 minutes. Spinach – Remove the stems and bake for 10 to 12 minutes until they dry out and crisp up. Beet Greens – Remove the tough inner rib of the stem, then bake for 15 minutes. Turn and bake for 10 more minutes. 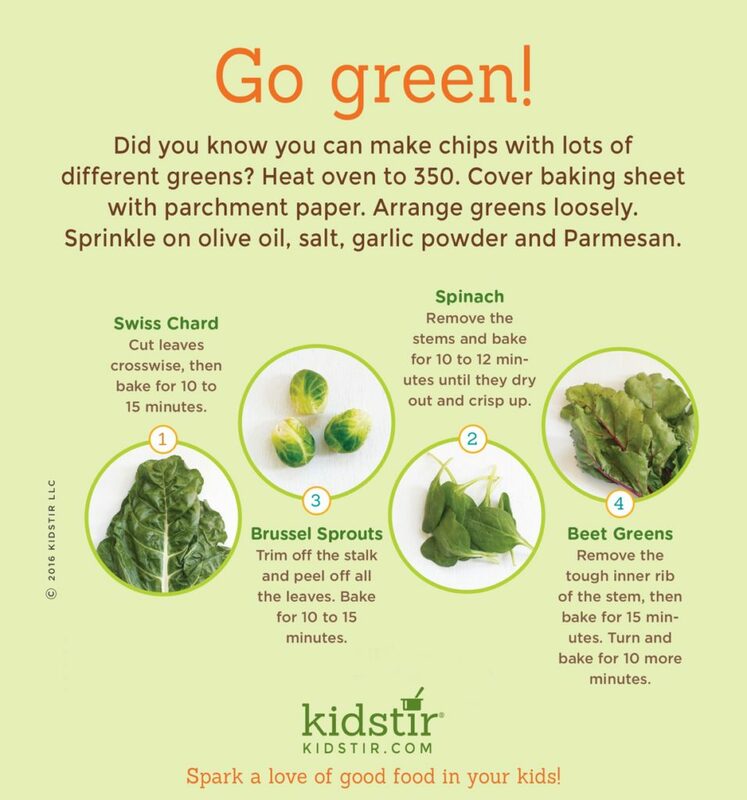 Don’t stop with these four tasty baked chips – you can make green veggie chips from any of your favorite leafy green vegetable. 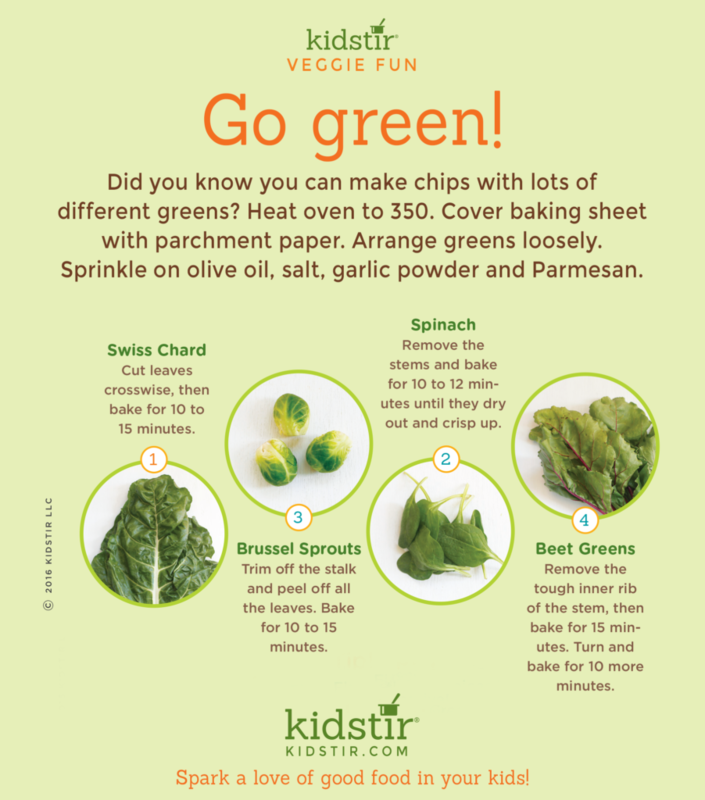 Here’s a few more green veggie chips to bake and enjoy! Try making snacks from Bok Choy, Broccoli Greens, Chard, Collard Greens and Mustard Greens. Please feel free to use this infographic and share it on your own site using the provided code snippet below. Next post: School Days Are Back!